On Saturday, I decide to take advantage of the beautiful sunny autumn day and go out on a photography "expedition" to the local pumpkin patches (we have two). The first pumpkin patch I visited is the one that sets up in a vacant lot in town where the Christmas tree lot also sets up later in the year. We had a really heavy rainstorm the day before that gave us a lot of rain all in one shot. 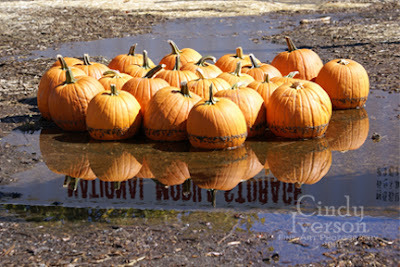 So I was not surprised to find a bunch of pumpkins sitting in a puddle (photo above). What did surprise me were the high water marks on the pumpkins! The person that had set up all the pumpkins around the lot had been quite creative in their arrangements which, combined with the great light, made for some nice photo opportunities. I then headed over to the other pumpkin patch that is actually a small working farm right in the middle of surburbia. There were lovely photo opportunities there as well. Enjoy! Prints of any of the above photographs are available up to size 13"x19". Please email me at rosehaven_cottage@yahoo.com for information. These are gorgeous! I really like the first one, how the words are reflected in the puddle. You're quite the talented lady! All the photos are great - but I really like the pumpkins in the water and their beautiful reflections. Good eye! Wow! Gourds 3 for $1...that would be considered a major bargain here...as I think I paid .69 each for mine! 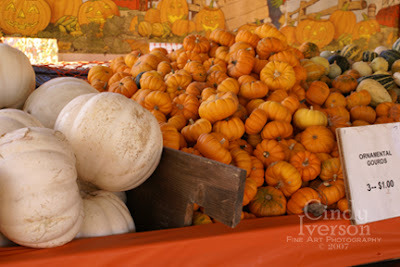 Great photos...I love pumpkins! Lovely collection, Cindy. I'm with 'kml' -- the one with the reflection is stunning. Thanks for the visual journey,must say, you are a great inspiration to me. Lovely post and I like the way you set it up, Cindy. You've put me in the mood to go pumpkin picking! 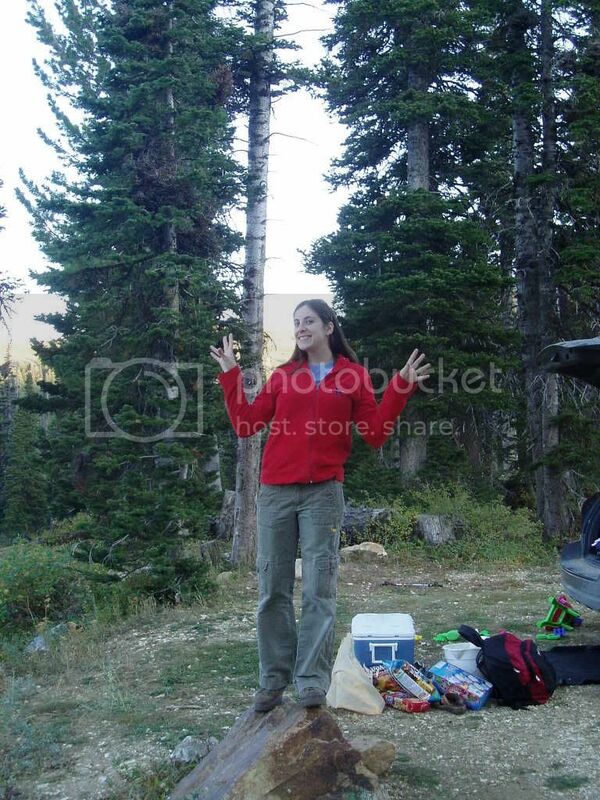 thanks for stopping by and saying Hi..you have a great blog! I will be back again..
You are right the light is just right, I love that top picture and I also like the corn that is all different colours.We are starting to see more of this sort of thing over here.